Good grief! 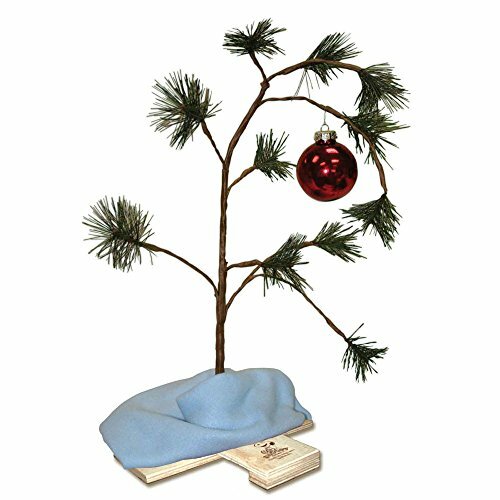 Now you can have your own Charlie Brown Christmas with this official 24-inch replica of the famous holiday tree from the 1965 animated Charlie Brown Christmas special. The ProductWorks 24-Inch Peanuts Charlie Brown Christmas Tree with Linus Blanket makes a great gift for fans of the classic comic strip and animated franchise. Decorated with the traditional red bulb ornament and Linus's blue blanket, this charming little tree will spruce up your home with holiday cheer and maybe even teach the true spirit of Christmas. The wooden base features the official Peanuts logo to prove its authenticity. Designed from sturdy materials, this tree will provide good tidings and good humor for many holidays to come. Measures 24" L x 9" W x 9" H and includes 1 tree, 1 red ornament, and 1 mini blanket. Measures 24" x 9" x 9"
If you have any questions about this product by ProductWorks, contact us by completing and submitting the form below. If you are looking for a specif part number, please include it with your message.